The Hotel Heidelberg was a fixture on Capitol Street for fifty five years. The hotel was opened by Roy and Cecil Heidelberg in 1922 , a modest building of five stories and only 124 rooms. Architect R.W. Naef’s towering addition of 1937 was designed in the “Modern” style of the period we have come to know as Art-Deco. This brought the published number of rooms to 300, though the actual number may have been smaller as at least a couple of them were used as permanent apartments for the Heidelbergs and for the Resident Manager. 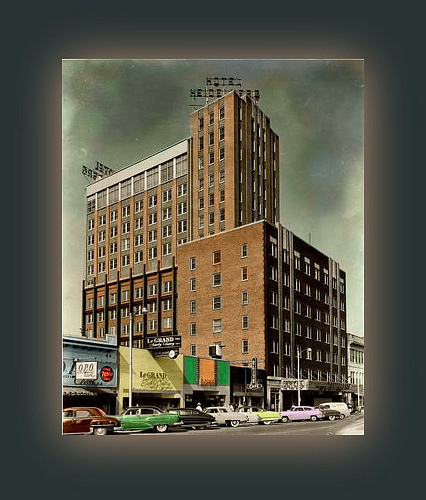 A state-of-the-art parking garage, known as the “Heidelberg Auto Hotel, ” was built in 1940-41. The rooftop Victory Room opened shortly thereafter, only to be followed by two more rooftop meeting rooms, the Silver and Olympic Rooms. The Heidelberg Roof was a popular venue for dining and dancing. Jerry Lane’s orchestra played here from November 1943 until 1960. Not as large or well known as its nearest competitors, the famed Blue Room at New Orleans’ Roosevelt or the Skyway Room at the Peabody in Memphis, the Heidelberg Roof still fulfilled a solid role in Jackson’s nightlife. Vocalist Betty Rogers filled the room with her sultry voice and crowds whirled the night away on the parquet dance floor. The Heidelbergs did not limit their investments to Jackson. They built the Hotel Heidelberg in Baton Rouge in 1927 and also owned the Hotel King across the street. The three hotels were often advertised together. 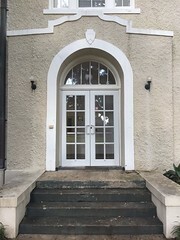 The Heidelberg in Baton Rouge was later sold and was under various names and ownership until its recent restoration as the Hilton Capitol Park. If only Jackson’s Heidelberg could have shared the same fate. The hotel was not as staid or formal as the Edwards, but it enjoyed undeniable popularity- especially with theater people and the meeting trade. 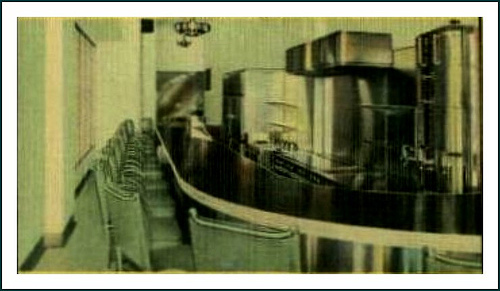 Instead of a grand dining room like that of the Edwards, there was a brisk coffee shop, an informal dining room called the Green Room and (at least at one time) a cafeteria as well. I don’t think it had a bar until much later. Liquor laws in Jackson made bars go into hiding until the sixties, though I doubt there was much of a drought here at any time in its history. The Heidelberg played a role in the history of Civil Rights as well. A number of important civil rights meetings were held at the Heidelberg. The hotel was integrated seamlessly, along with its neighbors, the King Edward and the Sun-n-Sand Motor Hotel. The owners of the Robert E. Lee Hotel nearby did not take this enlightened viewpoint and closed the hotel on the same day. The 275 rooms varied in size considerably, with the ones in the newer tower addition being preferred over those in the original building below. 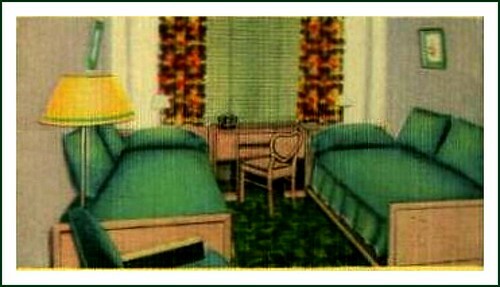 Most were economically minded twin rooms without a great deal of space. This was typical of hotels of the period. Though the hotel continued to renovate and reinvent itself through the 1950s and early 60s, it fell out of fashion and closed its doors on November 11, 1974. It was unceremoniously demolished in 1977 . I have memories of a brick-strewn lot with only the parking garage staring balefully down at the lot. This would fall within a couple of years. The ironically named Landmark Building occupies the site today. If anyone has memories or images of the Heidelberg, please post away. Thanks for the post, Tom. I hadn’t known much about the Heidelberg before, since it’s been gone a while, and this was a great introduction. Plus, I’d like to hang that colorized photo up on my wall–it’s amazing! Note that the original photograph is from the Clayton Rand Papers, not the Rand Clayton Papers. Maybe you could add info about the fire that occurred in the late 1940’s. It started in the ballroom. My parents and I were there and had to evacuate to another hotel. Yeah, and its not often I agree with that Malvaney character. Loved the pictures. But wouldn’t the Heidelberg have made a wonderful boutique hotel/condo development? Wow, I loved finding this article. I purchased many of the original light fixtures from the hotel in 1976 from the demolition company. I always hoped to find a renovation for them but no luck. The 12 deco metal and etched glass torcheres from the Victory Room are real treasures. If someone has information on who manufactured them I would be very interested to know. They are similar in style to the exterior wall sconces on the Plaza Bldg. These fixtures are presently for sale. Also a set from the 1930 renovation of the coffee shop in a western motif. Thank you for this article! Do you happen to have a picture of the light fixtures? They sound intriguing. 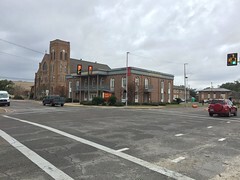 Perhaps there might be some interest in them from David Watkins or HRi with the Farish Street project…..It would be nice to see them placed in downtown Jackson again. Sure. Will send to you. I contacted David Watkins long time back. Seems architects were not interested. Too bad huh? Any other ideas? I agree that keeping them in MS would be a good thing to do. I know it’s been a while since you posted, but I was wondering if you still had any of the light fixtures that you wouldn’t mind parting with. I’m currently in AL, but when my husband retires (I already have) we’ll be returning to the Jackson area. I would love to have something from the Heidelberg. After the family moved out of the hotel, they moved to Belhaven area, about 3 blocks down the street from me. Such a fine family! I know it has been a while since you posted, but I was wondering if you were still willing to part with a couple of the torcheres. I was living in TX when it was torn down but am currently in AL. When my husband retires (I have already) then we plan to move back to the Jackson area. I grew up in Jackson from 1957-1970 and have wonderful memories of the Heidelberg. One of my best friends, growing up, was Terri Vickers, whose father was the manager of the hotel. I spent many delightful times with Terri and her mother, Trudy exploring the hotel and eating in the dining room where we indulged in the delicious Shrimp Remoulade and Pineapple Sherbet – an unforgettable experience for a young Southern girl. This is Teri. My husband discovered this post tonight, and how surprised I was to come across your comment. Earlier today we were downtown and came up High Street, and passed where I think your house used to be. That is where you lived, right? I too have such great memories of the year we lived at the Heidelberg, and remember eating my fair share of Shrimp Remoulade and Pineapple Sherbet. For a nine year old, being able to go to the restaurant by myself and order whatever I wanted was like living in a storybook. I’ve often wished the hotel was still there so I could see it with grown-up eyes. Wonders never cease! I got goosebumps when I saw your reply. Fifty years – gave or take – and I remember you so well. Proof positive that one is never too young or too old to leave a lasting impression. Yes, we lived on High Street until 1962, when the racial riots erupted in the street outside our front door. We then moved to North Street. I left Jackson the 2 days after I graduated from Central High School. My sisters and I revisited the area this past August and as we drove through the old neighborhood we reminisced about the good and the bad. You, Teresa Wills and her younger sister Pam were part of our conversation. I’ve always wondered what became of you. Isn’t life amazing? I would enjoy keeping in touch so I’ve requested your friendship on Facebook, Your smile is exactly as I remember. I have several memories of the Heidelberg, in high school the Beta Club conventions were there, while at Millsaps we crashed victory parties when Ole Miss or State played in Jackson, they opened the first legal bar in Jackson, 1966, when Prohibition was repealed, met Bobby Kennedy, Wayne Morse, and Ronald Reagan at the Heidelberg and spent first night of honeymoon with first wife there in 1968. I have the original picture of downtown jackson that was in the parking garage at the heidelberg hotel. It is about 4ft x 8ft. I bought it in 1976 or 1977 when the hotel sold everything. It is very interesting and gets a lot of comments, mostly from old people like me. Murrah 1970. Is the photo of the hotel? My Dad worked at the Heidelberg for 39 years before it shut down. Attended a military ball on the “roof” when I was in high school. We left Jackson in 1967 for Waco Texas where I still live and on my last return to Jackson to visit friends in 1998 I was disapointed to see what had become of my old home town. I loved Jackson a lot but nothing stays the same. 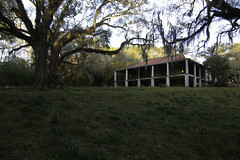 My husband and I bought Henry and Martha Hederman’s home on Old Canton Road about 11 years ago. The Hedermans visited us after we moved in and informed us that the parquet floor in our den was from the roof of the Heildelberg Hotel. He acquired the flooring as they were demolishing the hotel. I am looking for any photos of social events (dances, etc.) that were on “the Roof.” Many thanks. My father, Buddy Rushing, worked there from 1961 to 1969 first in maintenance under Grubbs. Then as Public Space Manager and then Assistant Manager. My mother, Yvonne, worked the front desk. We were there lots as children. I am told we saw The Monkees several times. Fred La Rue was a member of the owning corporation at the time. Bobby Gin was the chef. He also worked for Jim Vickers. He also worked George Albert Sr. And Jr.
Joan, I don’t remember your parents (maybe I would if I saw a picture, don’t know), but I do remember The Monkees as well as other celebrities staying at the Heidelberg during the mid-60’s. My father was Jim Vickers. We lived on the eighth floor of the hotel from 1964-1965 (my fourth grade year). I have very fond memories of Bobby Gin. Can picture him even now with his tall, white chef hat. He remained a family friend even after my dad started managing the Sheraton on I-55 North. And I also remember George Albert (don’t know if it was Sr. or Jr.), but have pictures of my parents (somewhere) with the George Albert I remember. Donna, the names Ruby, Winstead, and Myrick all stir vague memories for me, but none that I can put a finger on. During the year with lived at the Heidelberg (1964-1965) I remember freely roaming the hotel and often eating in the coffee shop and the Green Room. If your great aunt was a hostess during that time I would have known her well. Wish I could remember more. Both of my parents are gone, so I have no one to ask. My name is Richard Bailey. Teri, I worked for your father for a while many years ago at the Sheraton. I remember you when you were a teenager. I have fond memories of both your Mom and Dad. Later, I worked for George Albert Wilkinson, Jr. at the Jacksonian Inn as an auditor. At that time, Bobby Ginn was serving as the chef of LeFleur’s which was located next door to the Jacksonian. I’m wondering where Bobby Ginn went – he was a good friend of your father’s, I recall. I wound up as an employee of the U S Postal Service in Vicksburg from which I retired about a year ago. So many memories flood back from the late 60’s and early 70’s upon reading all these entries. Oh, and your brother John worked at the Sheraton during the period I worked there. So grateful to you for sharing some of the many memories you must have of the way life used to be in Jackson. Best wishes to you and your family! Richard, I remember you. Good to hear from you. Funny you should mention Bobby Ginn because I was thinking about him just the other day. I don’t know where he is. It’s been years since I’ve heard anything about him. Bobby worked at the Heidelberg when I was a little girl, then at the Sun-and-Sand (I think) before going to LeFleur’s. Seems like he may have worked at the King Edward too, but we’re talking many years ago and I was only a child, so I could be wrong. Mother died in February 1996, and I’m guessing since you worked at the Jacksonian that you remember that my dad died in 1981. Mother used to keep up with some of the people we knew from the Heidelberg and Sheraton. John lives in Arizona now, up in the mountains, and has for years. We talk a couple times a year, but I’ve not seen him since Christmas 2009. His ex-wife, Barbara (you might remember her), died several years ago, but their kids and grandkids still live in Mississippi. Like you said, lots of memories. I have been having a lot of nostalgia lately and when I go to downtown Jackson (to eat at the Mayflower) it is really intense,Tonight I was telling my son how my parents met at the Heidelberg “on the Roof” but now I find it had several “roof” .Wish I knew which one……..
Rachel, my father managed the Heidelberg during the early to mid 1960’s. We even lived there for a year when I was 9. I don’t remember there being more than one roof. I do remember it was remodeled on several occasions. So maybe that is why you’ve heard there was more than one. Then again, I was only a child, so maybe there was more than what I remember. I just found out that my great Aunt used to work at the Heidelberg as a hostess. Her maiden name was Ruby Winstead. Her last name might have been Myrick as she was married at one time to Mike Myrick. I never got to meet her as she was my grandpa’s half sister(his dad was married before my great grandma). I am trying to find out more info on her. So if anyone knew her or has any info on her please email me at artistd78@yahoo.com. I would love to find out more about her. Thanks for all the info on the Heidelberg,was really neat to read about it. My dad bought a bathroom medicine cabinet from the hotel not sure what year. Really want to restore so if any one has pics of bath. Dad is gone now and and left undone in his honer I would love to have this in my home. I do know that the Mississippi Department of Archives and History should have a vertical file with brochures of the Heidelberg. One of these may have pictures of the bathrooms, though I can’t recall exactly. 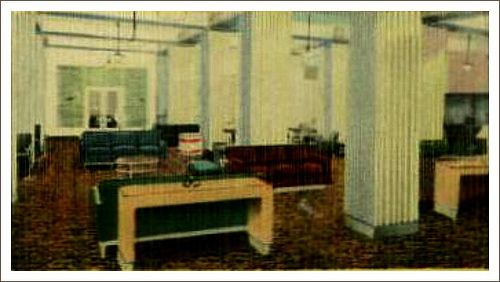 The post cards I have seen depict the lobby, bedrooms and the rooftop Victory Room. You might give them a call or visit them in person if you are in Jackson. I grew up a couple of blocks behind the Heidelberg in the 1940’s. There were a lot of kids in that area then and we often used the Hotel as a shortcut to Capital St. to get to parades (they had a lot of them back then) the movies and toy stores. From the back door and through the lobby we would pas the check in desk. A row of columns stood across from the desk where the bellboys in their red vests and caps would stand against while waiting for a bell. The Hotel had water fountains that used Artesian water and tasted awful.The Hotel had numerous areas devoted to conventions, meetings and entertainment functions of all kinds. Among these were the Victory Room, the Olympic Room, and the Roof where a full orchestra completes with a singer played while patrons dined, drank and danced the night away. The front of the Heidelberg was a beehive of activity with a constant stream of people passing through its large revolving doors opening out onto Capitol Street where a long line of taxis waited. At night the area was brightly lit and bustling with people going to the Roof and other events. At times at night the Salvation Army Band would occupy a couple of the parking places in front of the door and play with their kettle for collections. 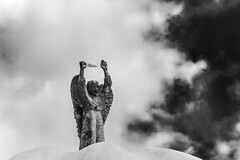 It was in the restaurant here that the first legal alcohol was served in the state and was consumed by the eminent liberal columnist Bill Minor, who in 2013 in his 90’s is still skewering conservative and republican politicians. Among notable patrons who stayed here were Bob Hope Dinah Shore, John F. Kennedy, Tyrone Power, and Raymond Massey among other celebrities of the day. It was just outside the Heidelberg entrance that my aunt and I saw General Douglas MacArthur, his wife and son in a motorcade when he was considering a run for the Presidency. When they were demolishing this Hotel a portion of it fell over and hit the old Royal Hotel (on the west side) that was above a Radio Shack. As I recall this happened in the middle of the night on a Sunday morning and no one was hurt. My Dad (Clyde Maxwell) and I investigated the collapse for the contractor. I have several photos of the Radio Shack full of brick and one of the side of the Royal Hotel with a huge hole the side of the building. Also the original building was not strong enough to support the addition so a steel frame was built on the outside that supported the addition. In cleaning out our old plans we gave a set of plans of the addition to Archives and History. Back in 1977 we did a lot of work with William Lampton Gill. He was an apprenticed Architect that had worked for R. W. Naef. When he passed away we inherited all the old plans Bill had stashed away. I’m going to post my pictures of the Heidelburg collapse on my blog site. I was born in Jackson in 1946. I remember the Heidelburg as one of Jackson’s landmarks through my whole childhood. My mother worked at Michael Baker’s engineers and around 1964 they held their Christmas party on the roof. I took (first name I can’t think of now) Kirk as my date. Later in life, an enterprise I started, the Mississippi Radio Network, moved its studio into the Heidelburg. We were the first affiliate in Mississippi of the Reuters news service. We set their Teleptype machine in the bathtub of one of the rooms we occupied. In those days, the Heidelburg’s bar was know as the “press room.” All the media people went there. Thank you for this summary of The Heidelberg Hotel. For those of us that came along afterward, finding information and anecdotes is not always easy. I will send this along to my family, and it will be much appreciated. The hotel still holds a wonderful place in our history and provides a bridge to conversation with so many that visited there. They all smile when they speak of it. My uncle, Buddy Vaughn used to be a soloist for Jerry Lane and his orchestra at the Jackson Heidelberg. Our family would gather around the radio on Sunday night ( or Saturday) and listen to the great music and Uncle Buddy. His real name was Buddy Varnado but adopted the stage name Buddy Vaughn. Anybody remember him? I have a great photo of him with the orchestra. I remember your uncle’s name well (his stage name). Do you have any idea what years he was soloing for Dad’s orchestra? I would love to see the photo of him with the orchestra. My father-Houston Davis-was the drummer with the Jerry Lane band for many years. I met and remember your uncle “Buddy Vaughn”-very friendly. I have several photos of the band at the Roof. I’ll check to see if he is pictured. I just came across this old post! Wow! My mother (Nell Norton) was a ticket agent for C and S Airlines and later Delta Airlines. They had a ticket counter at the Heidelberg. My parents met at the Heidelberg. My father (Russ Sessions) was playing clarinet and saxophone for the Jerry Lane Orchestra who played on the Heidelberg Roof. As small children, we though the Heidelberg Hotel was the grandest place on earth. Its demise was another sad commentary to downtown Jackson. Jonelle, I remember your dad so well. Jerry Lane was my father and we felt the same way you did about the Heidelberg. One of the things I remember best was the garage at the back of the hotel with the continuous one person elevator (don’t know what it was called) that those who worked at the garage could ride up to another floor to bring down a car or whatever. Don’t know what it was called but my father would park there at the back to run in and do one thing or another and we would sit in the car and watch that for hours it seemed. I am thrilled to hear from you! It is so nice to have someone else to share those wonderful memories. I would love to hear more about your dad. I am going to post the piece I wrote for Father’s Day which I posted on my Facebook page. Since my father and the Heidelberg were so closely tied together I hope this post about my dad will fit in and not be too long. My father, Wyatt Sharp (Jerry Lane), was born in 1908 in Eupora, Webster County, Mississippi, to Jessie Ila Duncan Sharp and Maud Wilson Sharp. He was an only child and doted upon by his father and mother. We have very little of a personal nature from his early years because of a fire that completely burned their house down and everything in it in the way of family history and everything else. My grandfather owned a printing business and published the newspaper, the Eupora Progress-Warden when Dad was a child . As far as I know my father had a middle class, relatively privileged and happy life. I have only one picture of Dad as a child. He is playing in a fenced yard in the garb of the day I suppose – it almost looks like a dress and short pants.When he was 12 or so his parents moved to Ruleville, Sunflower County in the Mississippi Delta. M.W. Sharp published the Ruleville newspaper and about the time Dad finished high school moved to Jackson to become Assistant Secretary of State for Walker Wood. I do not know at just what age it became obvious that he was very interested in music and that it came easily to him. I know that he played many different instruments before he settled on the trombone. He was recognized very quickly as being very talented and he played every chance he got. If there was a band he was in it whether it was at high school, college, radio orchestras, parades, etc. My mother always told me if he saw someone playing an instrument he would stop and play with them if they would let him. Daddy played in the Millsaps band, then the Tulane band. He played for WWL radio orchestra in New Orleans. He spent several years in New Orleans playing, and considered moving to Havana, Cuba to join the music scene there. I would bet his mother and father influenced his decision not to go to Havana. As he grew as a musician he began to realize that his talent was not just in music, but also as an entertainer. His primary life’s work was the Jerry Lane Orchestra (he took the stage name of Jerry Lane which was a common practice of that time). While most musicians had a day job to support themselves and their family, my father’s sole support was his orchestra and being secretary of the Musicians’ Union in Jackson which he always said helped buy the groceries. The Jerry Lane Orchestra played from 1943 to 1960 on the Heidelberg Roof, the premier night spot in Jackson. The Heidelberg Roof was his favorite place to play both because everyone in Jackson was seen there and because it allowed him to have more family time. Each night there was a live broadcast on WJDX radio of his band playing at the Roof at 10 p.m. People really enjoyed my father and loved listening to his music. “Music Served Southern Style” is what he called it and his theme song began every broadcast and every engagement he played. It was his signature sound associated only with his orchestra. He played for almost every party or event in Jackson, Mississippi, for years – all of my growing up years and before. He dominated the musical life of Jackson and in addition he played many out of town dates. Memphis, Baton Rouge, Monroe, Shreveport, Birmingham were all cities where he was well known. Rather than play lengthy engagements he opted to play mostly one-nighters so that he could come home and be with our family as much as possible. He played lots of military officers’ club events, Propeller Club, as well as country club events throughout the region. Dad knew almost everyone it seemed to us and everyone knew him. Dad was about 30 when he married my 18 year old mother, Edna Ruth Burks. They met over lunch at a boarding house in Jackson. They did not have children for almost ten years after their marriage and traveled a lot in the region as Dad played engagements here and there. My father was 40 when I was born and both my brother, Wyatt, Jr., and sister, Cindy came in the 3 years after that. Dad loved to fish and often went to Mayes Lake in Jackson after he finished up a late dance or ball. He often said he promised my mother that he would give up so much fishing when they decided to start a family. As I remember it he pretty much kept that agreement, fishing only every now and then. I can remember him getting his fishing equipment out as he would get ready to go and each of us would pose for the camera with life cushions, hard (ventilated) hats, and bamboo fishing poles. My father was enthusiastic about almost everything and his enthusiasm was contagious whether he was just at home with the family or when he entertained friends at home (or anywhere else) or when he was on stage. 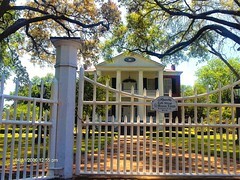 He was named by the governor Mississippi’s “Ambassador of Good Will”. It was a perfect honor because he brought “good will” wherever he went. He could talk to anyone. He was called Wyatt or Jerry or Pappy by all who knew him. We called him Daddy. He died May 31, 1988, on a blue moon night which always seemed to me to be a good night for him to go. Oh, my goodness! What a lovely, perfect tribute to your beloved father. Thank you for sharing that with me. Those were the days! Jackson and music by Southern gentlemen! Jonelle if you will email me at kathud56@yahoo.com I have a picture and article I would like to send you. Any chance that your father had any Huey P. Long stories from Baton Rouge’s Heidelberg Hotel? Author T. Harry Williams’ biography of the Kingfish revealed the love of music side of the would’ve been President. Long co-wrote the lyrics to Every Man A King. Thomas, I can remember my father talking about Huey Long and some interaction they had but that is all I can tell you. I know they had contact with each other about music and that is all I’ve been able to turn up. I asked my brother if he could remember anything and he was unable to. If I turn anything up I’ll give you a shout. Kathy- How well I remember your father. We called him “Pappy”. As noted above my father Houston Davis was the drummer for almost the entire history of the band. I recall they also did a radio program during the afternoon. I think the station or recording studio was in the hotel. Woody Asap [SP] was the announcer. Us kids were allowed to be in the studio with absolute orders to stay quite during the program. Your father was great with us kids, teasing us and making funny sounds with his trombone. My brother and I knew every crook and cranny of the Heidelberg. Other band members and close family friends were Russell Sessions-Sax,(could make my mother laugh constantly), Roger Noble-Sax, Reeves Hutchinson-Sax, “Ernie” Workman-trumpet, Gene Keshan- bass, Don “Zookie” Kazary-Sax, others I don’t recall. I’m unsure if band Photos can be posted here. If not, I’ll try and get them to you and Jonelle ASAP via email if you wish. I just found your post Paul. I must have missed seeing it when it came in. I remember your dad well and I think I remember that he did most of the arranging of numbers the band played. Is that right? Others I remember very well include Huron Hutcherson (Reeves’ brother I think), Billy Van Devander who may have come after your father (?? ), Betty Rogers, Buddy Vaughn and two or three other vocalists whose names are not coming to me at the moment. I have some of the broadcasts recorded and told Jonelle I would copy those and get to her. I have had trouble with that and I don’t know enough about it to understand what I am doing wrong. I would love copies of pictures and anything else you have. I don’t know if you have recorded music from the orchestra but if you don’t you may certainly have copies of what I have. A Mr. Algae Broome made these recordings from material at WJDX and provided them to my brother, Wyatt Sharp who still lives in the area. Jonelle will tell you that I intended to get them to her before now and still haven’t although it is not because I have not tried. Sometimes my ignorance gets the best of me. So good to hear from you. My email address is listed above so please let me hear from you again. Also I would think band photos would be welcome here but they will let you know if there is some problem with that. I believe they examine comments before they are posted. If you have the photos on a cloud server like OneDrive, Flickr, or Dropbox, you can post the links in the comments here. If not, you can send the photos to malvaney@misspreservation.com and I’ll post them here for you. WordPress doesn’t allow anyone except administrators to post photos in the comments. Thanks for sharing! I met my husband (Ed (B’) Childress from Flora, MS) in 1947 about a year after he returned from five years Army service in WWII, and we were married in 1949…….Heidelburg Roof was our favorite place to go for dinner and dancing from that time until we moved from Jackson/Vicksburg to the Miss Gulf Coast in the mid-50’s…..such a wonderful time in our lives. It was truly a wonderful Hotel! Does anybody know of a jeweller operating out if the Heidelberg Hotel in 1942/1943? Apparently they made the insignia (pilot wings) for the Dutch fliers being trained at Jackson Air Field in WW2. As a Dutch Historian (and collector) i am trying to find out more. Thank you. I believe that was Juniker Jewelers. Roy and Cecil Heidelberg had cousins who were attorneys. Do you know their names Mack Heidelberg? All were related to the Jasper County Heidelberg family. When I worked for John L. Turner, 1976 etc,during the sell off, Mr. Turner, with a learned eye for tradition, bought the chandeliers. 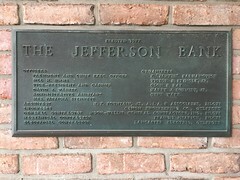 Those were placed into the remodeling of the Mississippi Bank building. Hope they are still there. Before the remodeling, the nice ceilings were covered by suspended acoustical ceilings as was the “progress” in those days. Before that, probably 1969 I am my band performed in the large upper banquet hall for either the VFW or American Legion convention (no longer sure which) but I hated to see the Hotel go down. “Walmart moves into town; Progress you can’t keep it down”..Tony Joe White.